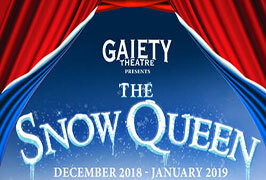 The Gaiety Theatre’s Christmas pantomime The Snow Queen, provides an unforgettable evening of hilarity for the whole family. Packed with brilliant comedy, stunning song and dance routines & dazzling costumes. The Gaiety Theatre welcomes you to a captivating retelling of a classic that is sure to enthrall the bright-eyed dreamer in all of us. The Snow Queen Christmas Pantomime has the recipe for a night full of music, laughter and youthful excitement. This Christmas, The Gaiety Panto will give this timeless tale its familiar lavish and fun-loving touch. 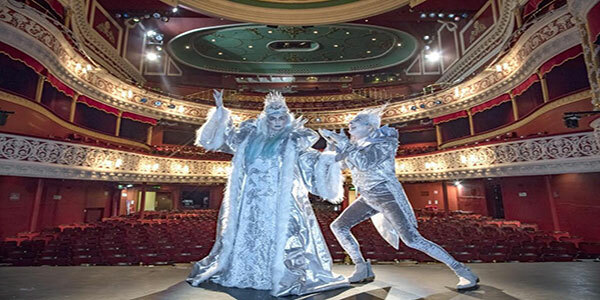 The Gaiety Theatre has hosted the annual Christmas Panto each year since 1873 and for the past 143 years has given the people of Dublin opera, musicals, drama, revues, comedy, concerts, dance, festival and pantomime. Today, families come from far and wide to the Gaiety Christmas Panto and for many it has become a true Christmas tradition. The Snow Queen Pantomime will begin a 6-week run from 25th November 2018 – 6th January 2019, so if you want to join The Snow Queen on her adventures, make sure to book early to avoid disappointment! Booking Online:- You can book online here through our booking link directly to the Ticketmaster ticket sales -for the Gaiety Panto. There are secrets in the snow and when Gerda’s best friend Kai goes missing, she must face her fears and embark on an epic quest to find him. A Pantomime Extravaganza packed full of merriment with singing, dancing and laughter, join them as we follow Gerda, with the help of an unlikely band of companions, as she travels to the Kingdom of Ice to confront the Snow Queen and rescue her friend. But things aren’t always what they seem? 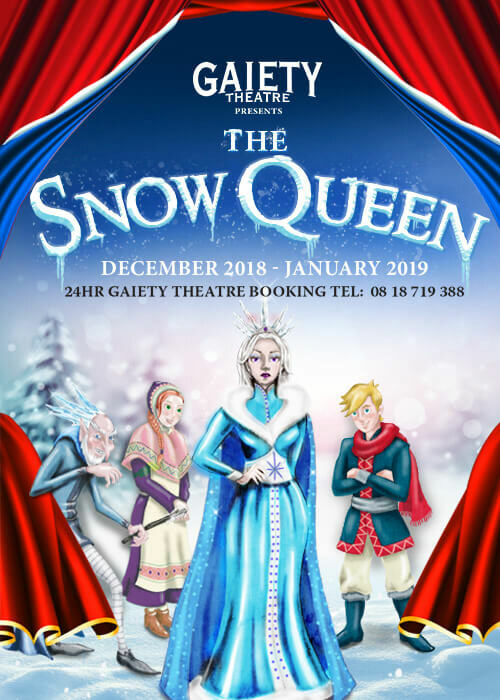 This holiday season, the timeless tale of The Snow Queen receives a contemporary touch from the finest Panto in Ireland. The Gaiety Theatre welcomes you and your family to a captivating retelling of a time-honoured classic that is sure to enthrall the bright-eyed dreamer in all of us. This event is most usually remembered as a child’s first introduction to Live Theatre and for that reason forms a lifelong bond with many adults in later life and becomes a strong family tradition to bring future generations to Pantomime. It is for this very reason that so many children, young adults, parents and grandparents deem their annual visit to the Gaiety Pantomime a must. A Christmas treat for all to enjoy young or old. Gaiety Theatre Box Office: Open Monday to Saturday from 10am-7pm and Sunday from 10am-6pm. No service charge for transactions in person at the Gaiety Box Office. Service charges apply to online and telephone bookings.